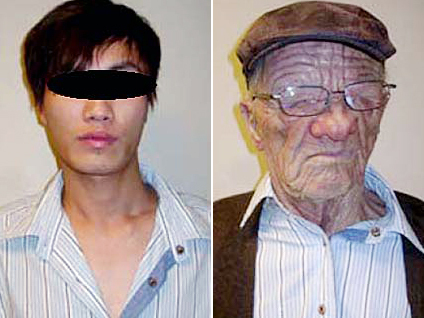 VANCOUVER (CBS/AP) A young man is in detention in Vancouver after Canadian authorities say he boarded an Air Canada flight in Hong Kong disguised as an elderly man. CNN reports the incident occurred on Oct. 29 on Air Canada flight AC018 to Vancouver originating in Hong Kong. The Canada Border Services Agency calls it an "unbelievable case of concealment." An agency bulletin issued Monday says the passenger was seen at the start of the flight as an "elderly Caucasian male who appeared to have young looking hands." The bulletin states that during the flight, "the subject attended the washroom and emerged an Asian looking male that appeared to be in his early 20s." Agency spokeswoman Jennifer Bourque confirmed an individual was intercepted trying to enter Canada under false pretenses on board an Air Canada flight. She told CNN the "foreign national is currently in CBSA detention" and that he will appear at an Immigration and Refugee Board hearing.